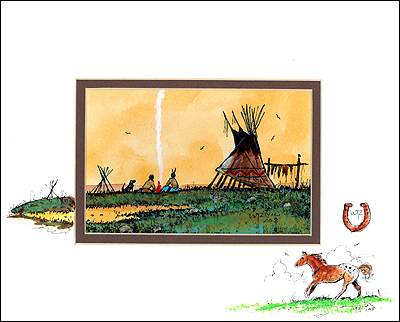 This is a classic teepee (or tipi) scene depicting a Commanche compound. The teepee was durable, provided warmth and comfort in winter, was dry during heavy rains, and was cool in the heat of summer. The Commanche speak an Uto-Aztecan language, sometimes classified as Shoshone.